Are you at risk of a fender bender when you drive into a parking lot? When you park your car and become a pedestrian, are you at risk while walking to your destination? 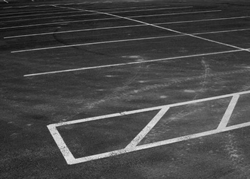 Parking lots come in many shapes and sizes. Some are huge and have many floors like a parking deck, some are on street level, some are very small and have only few spaces, while others are on one level and have a great many spaces. When we pull into one of these locations there is a pattern for parking. Some are straight in, while others have parking spaces that are on a diagonal. In some cases there are arrows to show you the direction to enter each lane, while others can have traffic going in both directions. It is important to pay attention and not be distracted while looking for a place to park. In addition to the difficulty in finding a place to put your vehicle, you should be aware of your surroundings. Are you pulling into a reserved space, are you parked next to a large vehicle, are you in a well-lit area if it is nighttime, it is important to be aware of all of these situations. Now that you have parked your car, are you in a safe spot? Did you take the necessary precautions? Is your car locked? Are your windows rolled up? Are all your valuables hidden such as the GPS, cell phones, laptops, purses, packages, radar detectors and DVD players. If you use a GPS that is attached to your front window, when you pull it off make sure the suction marks are erased off your window. Someone might break into the car, thinking that it is hidden somewhere in the car. Are you paying attention when walking, or are you talking on the cell phone or texting? Being distracted can cause a problem. Are there strangers hanging around? Are they asking questions? Notify security of anything that seems out of the ordinary. When your mission is complete and you return to your car there are other precautions that should be taken. Remember where you parked the car. Scan the area for suspicious persons, to be sure you are not being followed. If there is a large truck or van parked next to you, you can enter your car from the passenger side. Look around your car before getting in, make sure no one is lurking around, or hiding in the back seat. Once you are in the car, lock your doors and leave! Do not sit in the car doing other things. When you leave and are backing out of your space, you must be aware of people walking behind your car. Be aware that visibility may be a problem when you back out of your space and a large van, suv, or truck prevents you from seeing someone in the traffic aisle. Of course, the ideal situation would be for special sections for trucks and very large vehicles, and other rows set up for small and medium size cars, however, it does not work because most people take the very first space available, regardless of the size of the vehicle. Don't put yourself at risk. Take all the necessary precautions to be safe in parking lot areas. Additional safety tips for driving in reverse can be found at our Safety Alerts from the National Safety Commission.